Let me start by saying that I have absolutely no business reviewing a superhero movie. I have only seen a handful in total, and I went to see Aquaman at the request of a friend. I feel that I lack the prerequisite of fandom that these movies require of their audiences. Besides knowing the characters from jokes on Big Bang Theory, I have absolutely no understanding of the superhero world. For example I wouldn’t be able to tell the difference between DC and Marvel movies, comics and characters if my life depended on it. That being said this movie does seem to follow the typical superhero movie plot, almost formulaic in nature. First there is the backstory that leaves our unsuspecting hero with unresolved issues, usually an insatiable need to ‘do good’ and ‘save people.’ In the case of Aquaman, or as we meet him, young Arthur, is the illegitimate son of the former queen of Atlantis, Nicole Kidman, ahem, I mean Atlanna. Next, Arthur is called back to his not-so-homeland to challenge his half-brother King Orm for the throne. Apparently there’s a war brewing between the merpeople and the humans. Arthur then goes in search for a giant magic fork. He maybe does or doesn’t find it (no spoilers here) and goes to stake his claim in the giant fish war. 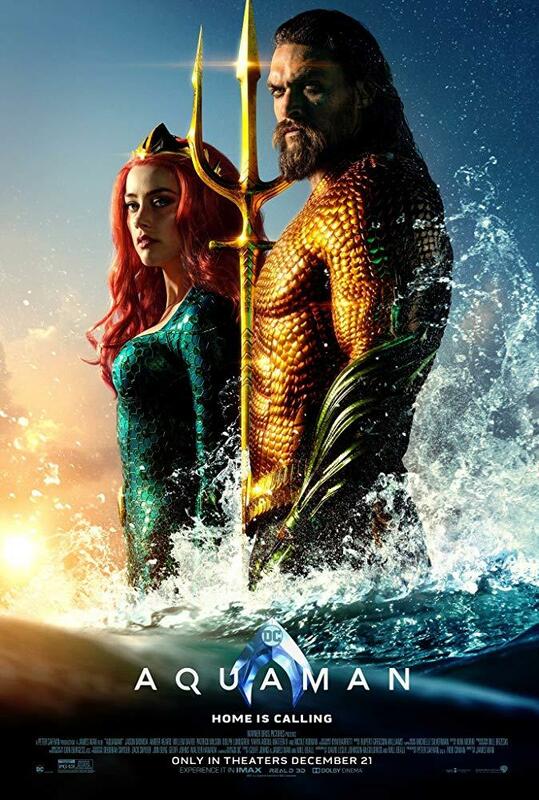 All along he is led by Princess Mera, played by Amber Heard. Both Kidman and Heard play strong, independent women, who take their roles within the underwater kingdoms seriously. Each are instrinsic to the plot, with Atlanna providing motivation to Aquaman and Mera acting as the force that enables his success. However, both are reduced to boring B-plots that revolve around their relationships with men. It should come as no surprise that this film fails the Bechdel Test (if you’re not familiar with this test, you would most likely enjoy seeing this film). Aside from the plot being more predictable than the ending to Titanic, the film has a lot to offer in terms of visual effects. Water is key, specifically to the character’s hair. This was an effect that I found ridiculously distracting while watching the movie. In fact, I’m sure I missed some important dialogue while being mesmerized by Jason Momoa’s flowing locks (and his abs). These feats of digital editing are made all the more apparent by the fact that this movie wasn’t filmed underwater. Go watch a YouTube video on how it was filmed; it will be ten times more entertaining than the actual film itself. Should you go see this movie? Eh. Not when there are so many better things to watch. With Oscar season upon us, there are countless options that are validated by a nomination from the Academy. If Beale Street Could Talk is showing at a/perture in downtown Winston-Salem. Or even use your Netflix subscription to watch Roma. Hell, even rewatching Beauty and the Beast was more enjoyable than sitting through two hours of underwater nonsense. Give me a movie about Queen Atlanna or even one where Princess Mera is the titular character. Don’t waste your time. Unless of course you are one of those fans who enjoys spending money seeing the same thing over and over again.